New Orleans Saints Coach Sean Payton said his National Football League team had a special operative who helped win the Super Bowl: sports agent Mike Ornstein. Payton said Ornstein helped arrange logistics such as game tickets and travel for players’ in-laws, minimizing crises. He also dreamed up irritations for the Saints’ opponent, the Indianapolis Colts, including strategically placing the Saints’ fleur-de-lis symbol around the Miami area. Payton said in his new book “Home Team: Coaching the Saints and New Orleans Back to Life,” that he got off to a rocky start with Ornstein, who called the team in 2006 to discourage Payton from drafting running back Reggie Bush. That conversation ended when the newly hired coach hung up on Ornstein with an expletive. Saints top 2010 Ultimate Franchise from ESPN! What an amazing turn around. It will be hard to say we don’t get any respect. My only question is, is the Who Dat Nation ready to defend this title as well for 2011? Yeaaahhhh That is what I thought! Posted in Who Dat's | Comments Off on Saints top 2010 Ultimate Franchise from ESPN! Pierre Thomas shows off his ring ! Pierre was at Sake Cafe Uptown the other night and fans had a chance to see his Superbowl Ring ! Make sure you keep up with his Facebook page to see where he will be out next ! Whodatnation.com was glad that he was able to take a picture for us to let fans see how proud he is of it ! 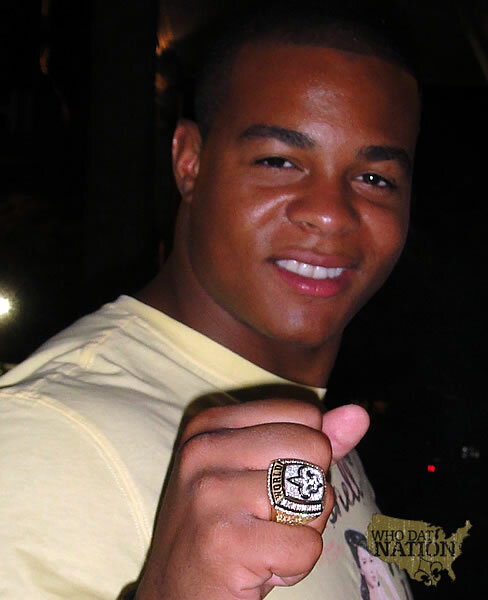 Posted in Pictures | Comments Off on Pierre Thomas shows off his ring ! The trade of Jammal Brown and release of Bobby McCray last week sent the Who Dat Nation into a mild state of offseason catatonia. Some saw the double whammy as the organization going cheap. Others viewed it as negligent mismanagement. I see it as a sign of a club reaching maturity. Five years into the Sean Payton regime, the program has evolved. A club once so desparate for talent it signed reclamation projects such as Dan Morgan and Rod Coleman now is casting aside Pro Bowlers. New Orleans Saints: An Emotional History. Another emotionally driven video. The history of the Saints and the Who Dat Nation has always been intense. Posted in Who Dat's | Comments Off on New Orleans Saints: An Emotional History. Defensive end Bobby McCray will no longer be competing for a starting role on the New Orleans’ defensive line this season, as the New Orleans Saints released the six-year veteran Monday. Parting ways with McCray was rather surprising, as he was the starting left defensive end in all three of the Saints’ playoff victories last season after Charles Grant suffered a season-ending torn triceps. In an unexpected move, the New Orleans Saints on Monday announced they have released defensive end Bobby McCray, who started for the team during its run to the Super Bowl title this past season. New Orleans Saints defensive end Bobby McCray takes down New England Patriots quarterback Tom Brady on Nov. 30 at the Superdome. McCray played two seasons with the Saints after signing as an unrestricted free agent in March 2008. He started eight of 32 games and made 59 tackles with 7½ sacks, three pass defenses and a forced fumble. The 28-year-old played the first four seasons of his NFL career with the Jacksonville Jaguars. He replaced Charles Grant in the Saints’ starting lineup after Grant was lost for the season because of injury and started all three of the team’s playoff victories. When the New Orleans Saints passed out their Super Bowl XLIV championship rings last week, several members of the team spoke about the bittersweet nature of seeing that great team gather together for perhaps the last time. New Orleans Saints Coach Sean Payton offers instruction Monday at the team’s practice facility in Metairie. But the truth is when the Saints begin training camp July 29, the team will be something very close to the 2009 version. There will be fewer jobs available on the 2010 Saints roster than at any other time under Coach Sean Payton. Still, Payton said he’s not approaching the upcoming camp or season with any predetermined mindset. The organization does not have a number, however vague, in mind in terms of how many roster spots might be up for grabs. I did not get a ring. Nor do I want one. Or deserve one. I kid, but there are plenty of people who have asked me in recent weeks if I got a ring. Indeed, it’s the question everyone around town has asked since the New Orleans Saints announced last month they’d award their Super Bowl XLIV championship rings last Wednesday. The Saints had to draw the line somewhere in the selection process, and it’s hard to argue with the 219 folks who ultimately made the cut. The decision process was not an easy task. And the job fell primarily to General Manager Mickey Loomis. The New Orleans Saints on Saturday afternoon announced that two-time Pro Bowl tackle Jammal Brown has signed his one year, $3.6 million tender and been traded to the Washington Redskins. The Saints’ release said the team will receive an undisclosed pick in the 2011 NFL draft from the Redskins. Brown, a 2005 first-round draft pick from Oklahoma who has been a starter since his rookie year for the Saints, missed all of last season after having hip and hernia surgery during training camp. Jermon Bushrod started in Brown’s place last season including the Saints’ 31-17 victory over the Indianapolis Colts in Super Bowl XLIV.